This Purchase Agreement is for the cash sale of a truck stop property and business from the owner and the owner's operator as sellers to a new buyer operator. The sale includes both the real estate and the equipment, office furniture, supplies, etc for the truck stop plaza. Prior to the execution of the agreement and the closing, the owner of the real estate held title to the property, and the operator ran the truck stop business pursuant to a lease, which will terminate at the closing. The buyer will operate the business and own the property at the closing. The agreement is comprehensive, and includes detailed closing obligations for the parties, representations and warranties by both the buyer and the seller, covenants by the parties, conditions that must be satisfied prior to closing, indemnification provisions, and post closing covenants. 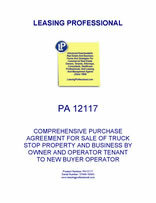 This AGREEMENT is made as of _________________, 20__ by and between, COMMERCIAL PROPERTY OWNER, ("Owner"), a __________ corporation with offices located at __________________________, TRUCK STOP OPERATOR ("Operator Tenant"), a ____________ corporation with an address at _______________________ (Owner and Operator Tenant are hereinafter collectively referred to as the "Sellers") and COMMERCIAL PROPERTY BUYER, a ___________ corporation and or its assigns, with an address at ________________ (the "Purchaser"). WHEREAS, the Sellers desire to sell to the Purchaser and the Purchaser desires to purchase from the Sellers the Property and the assets of the Truck Stop Business upon and subject to the terms and conditions hereinafter set forth below. (A) The Property, including the land with the buildings and improvements erected thereon as more particularly described in Schedule A annexed hereto and made a part hereof. This sale includes all right, title and interest, if any, of Owner in and to any land lying in the bed of any street, roar or avenue opened or proposed, in front of or adjoining the Property, to the center line thereof, and all right, title and interest of Owner in and to any award made or to be made in lieu thereof and in and to any unpaid award for damage to the Property by reason of change of grade of any street; and Owner will execute and deliver to Purchaser, on closing of title, or thereafter, on demand, all proper instruments for the conveyance of such title and the assignment and collection of any such award. (i) Zoning regulations and ordinances of the city, county, town or village in which the Property is located which are not violated by existing structures. (ii) Consents by Owner or any former owner of the Property for the erection of any structure or structures on, under or above any street or streets on which the Property may abut. (iii) Encroachments of stoops, areas, cellar steps, trim and cornices, if any, upon any street or highway or any other property which the Property may abut. (iii) except as otherwise provided, all transferable operating permits, or tank permits, and other permits, licenses, filings and other governmental authorizations and agreements, all assignable contracts, including vendor contracts, billboard leases, service agreements and like contracts and agreements associated with the operation of the Truck Stop Business which are set forth in Schedule 1.1(B) (iii) annexed hereto and made a part hereof. Purchaser acknowledges and warrants that it is aware that the diesel and gasoline supply agreements relating to the Truck Stop Business are not transferable to Purchaser and that Purchaser shall be solely responsible for arranging for new agreements for the delivery of all fuel with its diesel and gasoline suppliers. All of the assets used in connection with the Truck Stop Business to be transferred to Purchaser hereunder are herein referred to collectively as the "Truck Stop Assets." All of the Truck Stop Assets shall be transferred subject to normal wear and tear and without warranties of any kind, whether expressed or implied, other than warranties of title, and are sold "AS IS, WHERE IS", WITH ALL FAULTS AND DEFECTS" and "WITH NO REPRESENTATION OR WARRANTY AS TO CONDITION, MERCHANTABILITY, FITNESS OR SUITABILITY FOR ANY PARTICULAR PURPOSE", WHETHER EXPRESS, IMPLIED OR STATUTORY. As used in this Agreement, "Lien" shall mean any conditional sale agreement, charges, defect of title, easement, encroachment, encumbrance, hypothecation, infringement, lien, mortgage, pledge, reservation, restriction, security interest, title retention, or other security arrangement, or any adverse right or interest, charge, or claim of any nature whatsoever of, on, or with respect to any property or property interest, other than liens for taxes not yet due and payable. Notwithstanding the foregoing, the transfer of the Truck Stop Assets pursuant to this Agreement shall not include the assumption of any Liability related to the Truck Stop Assets unless Purchaser expressly assumes that Liability pursuant to Section 1.3. For purposes of this Agreement, "Liability" shall mean any direct or indirect, primary or secondary, liability, indebtedness, obligation, penalty, cost, or expense, claim, deficiency, guaranty, or endorsement of or by any person of any type, whether accrued, absolute or contingent, liquidated or unliquidated, matured or unmatured, or otherwise. 1.2 Excluded Assets. Seller's income tax records, corporate minute books and stock records of Sellers are not part of the sale and purchase contemplated hereunder, are excluded from the Truck Stop Assets, and shall remain the property of Sellers after the Closing. 1.3 Assumption of Liabilities. Subject to the terms and conditions of this Agreement, at the Closing, Purchaser shall assume the liabilities (the "Assumed Liabilities") with respect to the Truck Stop Business arising after the Closing Date as set forth in Schedule 1.3 annexed hereto and made a part hereof. The Assumed Liabilities shall not include any agreements, contracts or commitments that are not specifically identified herein as Assumed Liabilities and except for the Assumed Liabilities of Operator Tenant set forth on Schedule 1.3 the Purchaser shall assume no Liabilities of the Seller. 1.4 Conditions of Sale. The Sellers' obligation to convey the Property and Truck Stop Assets shall be conditioned upon the approval of this Agreement by the Board of Directors of Operator Tenant Parent, the parent of Operator Tenant. (B) ___________ ($________) Dollars in cash, good Certified Check, Bank Draft or Wire Transfer to the order of the Seller or their designee simultaneously with the delivery of the Deed. 2.2 Allocation of Purchase Price. The Purchase Price shall be allocated in accordance with Schedule 2.2. After the Closing, the parties shall make consistent use of that allocation for all Tax purposes and in all filings, declarations and reports in respect thereof; including the reports required to be filed under Section 1060 of the Code (e.g., IRS Form 8594). The parties shall report the tax consequences of the transactions contemplated by this Agreement in a manner consistent with the Purchase Price Allocations, as determined pursuant to this Section and shall not take any action or position that is inconsistent therewith. 3. 1 Closing. Subject to the satisfaction of the conditions set forth in Sections 7.1 and 7.2 hereof (or the waiver thereof by the party entitled to waive that condition) the closing of the sale and purchase of the Property and Truck Stop Assets to Purchaser (the "Closing") shall take place at __________________________ on _______________ (the "Closing Date") or at such other place or time as the parties may agree. (A) A Deed to the Property in the usual and customary form of a deed utilized in the State of ____________, suitable for recording and shall be duly executed and acknowledged so as to convey to the Purchaser the fee simple of the Property, free of all encumbrances, except as stated herein, and shall contain any lien law covenant required by applicable law. The delivery of the Deed by Sellers and acceptance thereof by the Purchaser, shall be deemed the full performance and discharge of every obligation of Owner to be performed hereunder, except those obligations of Sellers stated in this Agreement to survive the Closing. (B) A duly executed Bill of Sale for the Truck Stop Assets. (C) Certified copies of resolutions indicating that this Agreement and the transactions contemplated hereby have been approved by the Board of Directors of each of the Sellers. (D) A certificate indicating that the lease between Owner and Operator Tenant for the Property has been terminated and is of no further force and effect as of the Closing Date. (E) Releases, pay-off letters and UCC-3 termination statements from all persons holding mortgages or liens on the Property or the Truck Stop Assets. (F) Duly completed and executed certifications pursuant to Section 1.445-2 of the Treasury regulations certifying that the Sellers are not foreign persons. (G) A receipt for the portion of the Purchase Price paid at Closing. (H) Such other documents as the Purchaser may reasonably request. (A) Payment by wire transfer, certified or bank check for the balance of the Purchase Price in the amount of $________________ in accordance with Section 2.1 of this Agreement. (B) Payment for all transfer taxes related to the sale of the Property and the Truck Stop Assets. (C) Certified copies of resolutions indicating that this Agreement and the transactions contemplated hereby have been approved by the Board of Directors of the Purchaser. (D) Such other documents as Sellers may reasonably request. (A) Real estate taxes, water charges and sewer rents on the basis of the fiscal or calendar period for which assessed, except if there is a water meter on the Property, apportionment at the Closing shall be based on the last available reading, subject to adjustment subsequent to Closing when the next reading is available. If the Closing shall occur before a new tax rate is fixed, the apportionment of taxes shall be on the basis of the old tax rate for the preceding period applied to the latest assessed valuation. (B) The amount of any unpaid taxes, assessments, water charges and sewer rents which the Sellers are obligated to pay and discharge, may at the option of the Sellers be allowed to the Purchaser out of the balance of the Purchase Price, provided official bills therefor with interest and penalties figured to said date are furnished by the Sellers at Closing. 3.5 Use of Purchase Price to Pay Liens. If at the Closing Date there may be liens or encumbrances on the Property or Truck Stop Assets which the Sellers are obligated to pay and discharge, the Sellers may use any portion of the balance of the Purchase Price to satisfy the same, provided the Sellers shall simultaneously either deliver to the Purchaser at the Closing instruments in recordable form and sufficient to satisfy such liens and encumbrances of record together with the cost of recording or filing said instruments; or, provided that the Sellers have made arrangements with the title company employed by the Purchaser in advance of the Closing, Sellers will deposit with said company sufficient monies, acceptable to and required by it to insure obtaining and the recording of such satisfactions and the issuance of title insurance to the Purchaser either free of any such liens and encumbrances, or with insurance against enforcement of same out of the insured Property or Assets. The Purchaser, if request is made within a reasonable time prior to Closing, agrees to provide at the Closing separate certified checks as requested, aggregating the amount of the balance of the Purchase Price, to facilitate the satisfaction of any such liens or encumbrances. The existence of any such taxes or other liens and encumbrances shall not be deemed objections to title to the Property or Truck Stop Assets if the Sellers shall comply with the foregoing requirements.